Before leaving Tuba City, we went to the museum right next to our hotel, one of my favourite stops on this trip. The Navajo Interactive Museum shares some of the Navajo’s own history. It is the first place I have ever been that does not try to whitewash the history of conquest. It does not shy away from how people were killed, enslaved. It tells of the forced march, relocation, return. The immense loss. Grief. It shows how much has been saved, how custom and belief are not things of the past but of the present. It shared versions of the creation. Methods of weaving, the sheep that are the sources of wool. The building of hogans and some of their spiritual meanings. It is divided by the four directions, reclaims history for its own people, and offers it as a gift to us. Indigenous languages are holistic, fluently expressing intrinsic human relationships with everything. Navajos believe that their language is a spiritual gift from the Holy People, for it connects them directly to the entire universe. It is a language of webs and motion, relationships and process, not of nouns and objectivity. I have been thinking so much about language and patterns of thought, the limitations of science and how perhaps it is built into the English language itself. Spanish too, but just knowing two languages helps you understand language’s limits. There is still so much I cannot express, I wish that I had been honored to speak such an indigenous language. It is not hard to see why conquerors would work so hard to destroy language, it is so intertwined with culture, with worldview. It is always a place of strength and resistance. (1) On December 7, 1941, the Japanese Empire attacked Pearl Harbor and war was declared by Congress the following day. (2) The military code, developed by the United States for transmitting messages, had been deciphered by the Japanese and a search by United States military intelligence was made to develop new means to counter the enemy. (3) The United States Government called upon the Navajo Nation to support the military effort by recruiting and enlisting 29 Navajo men to serve as Marine Corps radio operators; the number of enlistees later increased to over 350. (4) At the time, the Navajos were second-class citizens, and they were a people who were discouraged from using their own language. (5) The Navajo Marine Corps radio operators, who became known as the Navajo Code Talkers, were used to develop a code using their language to communicate military messages in the Pacific. 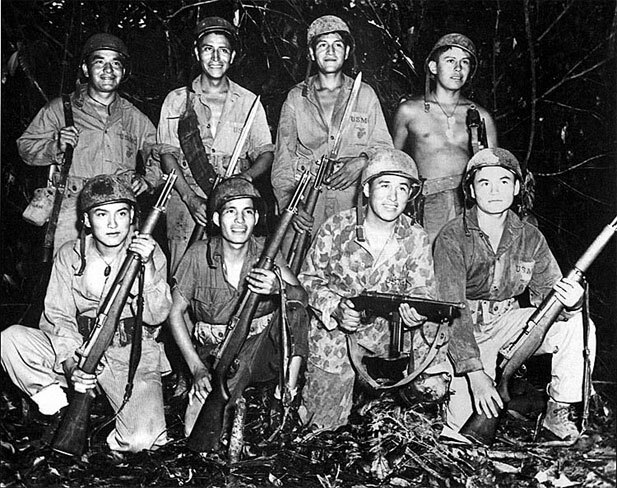 (6) To the enemy’s frustration, the code developed by these Native Americans proved to be unbreakable and was used extensively throughout the Pacific theater. (7) The Navajo language, discouraged in the past, was instrumental in developing the most significant and successful military code of the time. At Iwo Jima alone, the Navajo Code Talkers passed over 800 error-free messages in a 48-hour period. (C) So successful were they, that the code was kept secret for 23 years after the end of World War II. (8) Following the conclusion of World War II, the Department of Defense maintained the secrecy of the Navajo code until it was declassified in 1968; only then did a realization of the sacrifice and valor of these brave Native Americans emerge from history. I am unsure what the U.S. government has done since then to grant full, respectful, honoured citizenship or to encourage the speaking of indigenous languages, but I suppose medals were something. It would take a few years before other tribes were honoured for similar roles, the Comache and Choctaw among them, in WWI as well as WWII. We drove and drove, Northeast, out of the red rocks towards New Mexico. We passed Black Mesa, and the Peabody Company’s coal mine — another reminder of exploitation, another form of resource extraction. Peabody uses this pristine water supply simply to mix with crushed coal-called “slurry.” This “slurry” is then pumped through a pipeline over 275 miles to the Mohave Generating Station in Nevada. With every breath we take, 50 gallons of pristine ground water has just been pumped from the dry lands of northeastern Arizona. On Black Mesa, home to the Hopi and Navajo people, more than 300 gallons of potential drinking water has, in the last 10 seconds just been mixed with crushed coal. In the time it took to read these sentences Peabody Coal Company pumps over a thousand gallons of the cleanest groundwater in North America, simply to transport coal. Today, Peabody Coal pumps more than 3,600 acre-feet (equivalent to 4,600 football fields, one foot deep) per year of pristine water from the Navajo Aquifer. From World War II until 1971, the government was the sole purchaser of uranium ore in the United States. Uranium mining occurred mostly in the southwestern United States and drew many Native Americans and others into work in the mines and mills. Despite a long and well-developed understanding, based on the European experience earlier in the century, that uranium mining led to high rates of lung cancer, few protections were provided for US miners before 1962 and their adoption after that time was slow and incomplete. The resulting high rates of illness among miners led in 1990 to passage of the Radiation Exposure Compensation Act. You can read and listen to more on Democracy Now’s program ‘A Slow Genocide of the People’. Even now people gather to stand against another exploitation of the earth and threat of contamination for land and water — the North Dakota pipeline. In North Dakota, indigenous activists are continuing to protest the proposed $3.8 billion Dakota Access pipeline, which they say would threaten to contaminate the Missouri River. More than a thousand indigenous activists from dozens of different tribes across the country have traveled to the Sacred Stone Spirit Camp, which was launched on April 1 by the Standing Rock Sioux Tribe. I wish I could be there too. Instead I am here, writing. We drove onward. It looks pristine, but corporations are poisoning this land. A sea of crushed metal, old cars left here. Up to the ‘Aztec’ ruins. Midway between Chaco and Mesa Verde, this was an incredible Anasazi construction, planned and for the most part built within a very short time. 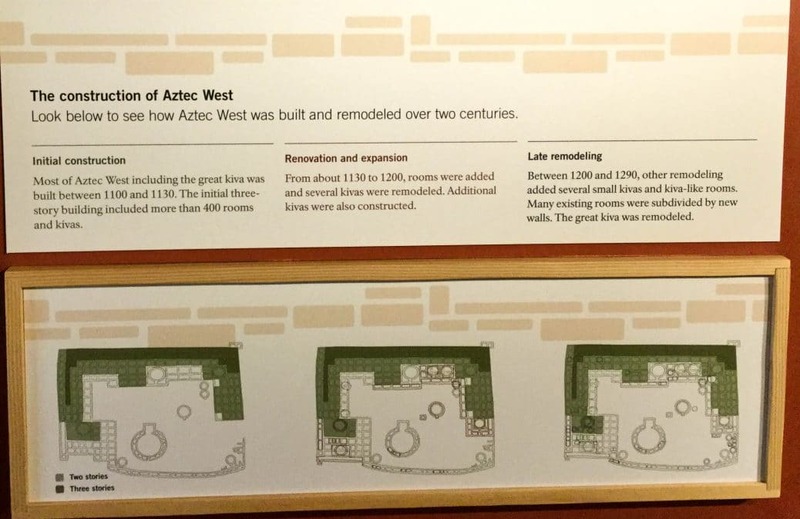 Labelled Aztec because that’s all people apparently knew of indigenous cultures building in stone, too ignorant or racist to ask its real name. The National Park Service did try to give a ‘balanced’ history, but such radically different ways of seeing the world sit uneasily next to each other. There could be nothing too critical of the role archeology has played in the mythologizing of western expansions, nor of those expansions, nor the disrespect of native histories. A disrespect that stems from their attempted destruction. But it was good to hear native voices here, and the contrasting ways of seeing. This is a place that feels good, a place left to the ancestors before white men arrived, like Chaco, like Mesa Verde. They open into other rooms, a mat left behind is still here, hundreds of years old. From archaeology we see the map of the whole. Almost all of it built between 1100 and 1130, which is amazing. Then slowly added to. This map shows its symmetries, though it cannot explain their meaning. They have reconstructed the great kiva here, I am not sure about entering such a place of ceremony without ceremony. Without invitation. So I didn’t take pictures, but I did give thanks to be there. With mum. They are wonderful sacred spaces. Several of them, along with the large central one, are surrounded by smaller rooms. I have never seen this before. From here we continued on and on, up to Chama. A good day.